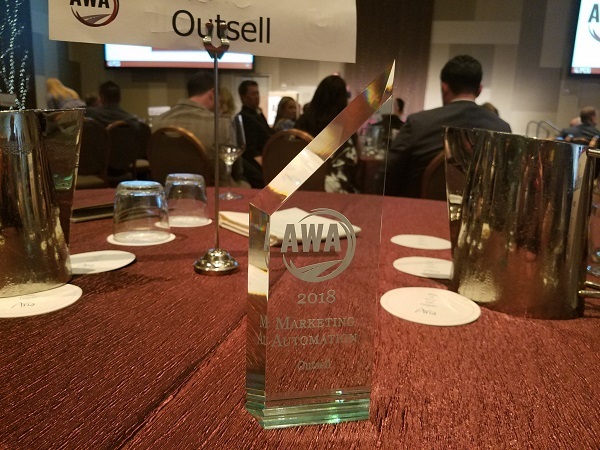 Outsell announced recently that it has won a coveted 2018 Automotive Website Award (AWA) in the Marketing Automation category. The awards were bestowed during a ceremony at the NADA 2018 conference, taking place on March 22 in Las Vegas. The Automotive Website Awards, created by PCG Companies, showcase the top marketing solutions for automotive dealers across several categories. This is the second consecutive year that Outsell has been honored. The company’s new Inventory Mover solution, which helps automatically match prospects with specific inventory, was cited as a key reason for its being named a winner for 2018. Outsell was the first marketing automation provider in automotive to utilize artificial intelligence (AI) to help improve relevancy and targeting. Its AI brain tracks the behavior of individual consumers (both customers and prospects), forming a predictive model of their future behavior, and fueling Outsell capabilities such as buyer detection for identifying in-market shoppers, and Inventory Mover. At NADA, Outsell launched its newest platform, Outsell 5.0 [link], enhanced with even more artificial intelligence capabilities, providing automotive dealers with unprecedented insight into buying behavior and the ability to take individualized content to the next level, with automated, multi-channel communications that are customized to each person’s exact preferences.